This large one bedroom, one bath unit has a private lanai set on the beautifully manicured, tropical grounds of Hale Kamaole Resort where the setting and large units have led it to be known as one of the best values on Maui. Recently updated and in excellent condition, the condo is a ground floor unit with a/c and tile floor throughout to keep the unit cool and clean while you are there. This unit is on the ground floor making trips to one of the two pools, either of the BBQ areas or the tennis courts very convenient. It also means no stairs to climb with your luggage or your groceries. A one bedroom unit with a pull out sofa sleeper, it accommodates 4 comfortably. It comes fully equipped with a fridge, stove, microwave oven, dishwasher and stacked washer/dryer. There are plenty of plates, glasses and cutlery along with extra linens and beach towels, etc. Two TV’s, DVD player and a stereo for days you want to relax or cool down. The Hale Kamaole condo complex is in South Kihei, directly across the street from the Kamaole III Beach Park. There are fantastic beaches within walking distance, shopping, restaurants and golf very close by as well. The Kamaole Beaches are a great place to relax, snorkel or do a little boogie-boarding. The beach is sandy and the waves are not too big, making swimming and playing in the water safe for all ages. The beaches have lifeguard stations, and there is a convenience store across the street for cool drinks and snacks. 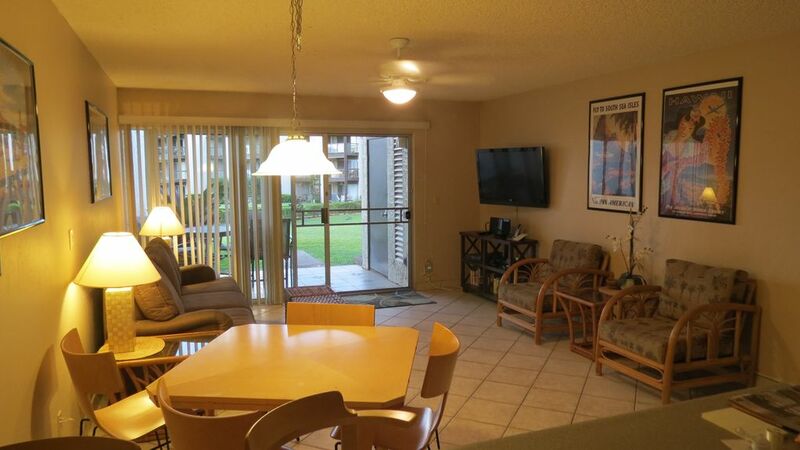 The Hale Kamaole units are spacious and have a great floor plan. Comfortably accomodate 2-4 people and never feel cramped. Nice view of the ocean from the lanai. We have beach chairs, towels, beach mats, coolers, boogie boards, snorkel gear and everything else you need. This place was well equipped with everything we needed. Great location, just a quick walk to the beach. Great property and we would stay again. Everything I expected and was hoping for. I am very familiar with this property and have stayed at Hale Kamaole many times over the years. This unit was especially nice, reasonably priced and bonus; It has a lovely ground floor patio, is right near the pool and there are beautiful beaches right across the street. Hopefully we'll be able to stay there again soon. This unit was great. Very clean and so well stocked. Love the walk out to the lawn, pools, tennis courts and BBQs. Great location to Kamaole Beaches 2 and 3, and easy access to the highway to the rest of the island. Great condo, fully stocked with everything you need for a great vacation! Lori was a wonderful host , we will be back! This complex is a wonderful place to stay. Very well set up for socializing yet private if you want it. This is our second year and we will probably be back next year. Stay was great as always!! Great weather, big waves, Sunshine & friendly people....can't wiat to return to Maui again! !